I will always remember growing up how my sister and I would get cute Easter outfits to wear to church. Let me tell you; I got the girlish dresses usually with pink, flowers, and lace. And I loved it. 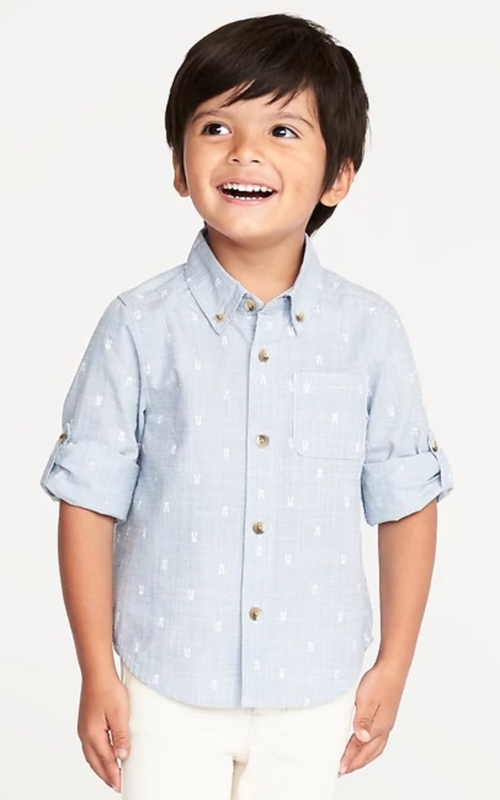 Now that I have my little guy, I love the idea of getting him an Easter outfit. I had a hard time finding something cute, yet not corny. The selection at my usual go-to toddler clothes stores — Carters, Target, Old Navy, and Gap — was disappointing. Old Navy won in the end with a cute bunny shirt and khaki pants. Little boys clothing can be so adorable, but the selection is much less than what I see for little girls. If I had a little girl, this Easter outfit search would have been hard in that I wouldn’t know what to chose! Easter baskets are such a fun tradition. Growing up my sister and I would leave our baskets out for the Easter bunny the night before. On Easter morning there would be a trail of eggs from our bedrooms, through the house, and leading into a room. Then we would have to find our hidden basket somewhere in that room. Once the basket was located, the whole family would sit down in the living room, and we’d see what the Easter Bunny brought. I enjoyed this tradition so much as a kid and wanted to do the same of Caleb. Caleb isn’t quite ready for the full-blown version of this tradition, but I’m going for some of it. For starters, I am putting together an Easter basket for him. I am trying to keep it simple and not go overboard. I am finding this difficult since there are so many cute things to put in an Easter basket. To make it easier, I decided to categorize what I put for his basket. 1. Stuffed Animal - I always got a stuffed bunny in my basket, which is so sweet for Easter. Caleb isn’t big on bunnies, but he loves dogs. When we're at the toy store, Caleb grabs these Douglas stuffed animals, so that's what I ended up getting for him. 2. Candy - This is another “must” for the basket. 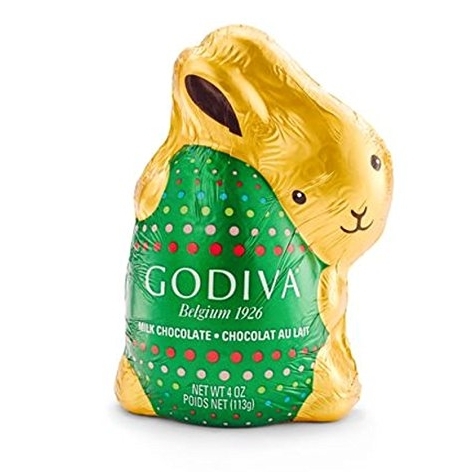 In the future, there will be a chocolate bunny. But no big chocolate bunny for Caleb quite yet. That much chocolate consumption would be scary; he’d go nuts. But little candies like jelly bellies is perfect. 3. Book(s) - I thought this would be a fun little basket tradition. Caleb has enjoyed the Elephant and Piggie books, so I picked up We Are In Book! I didn’t intend to put two books in, but I couldn’t pass up this All About Peter board book. 4. Toys(s) - I think about two small toys are perfect. Caleb has a lot of trains and trucks, so I thought an airplane would be fun (here's a somewhat similar one on Amazon). 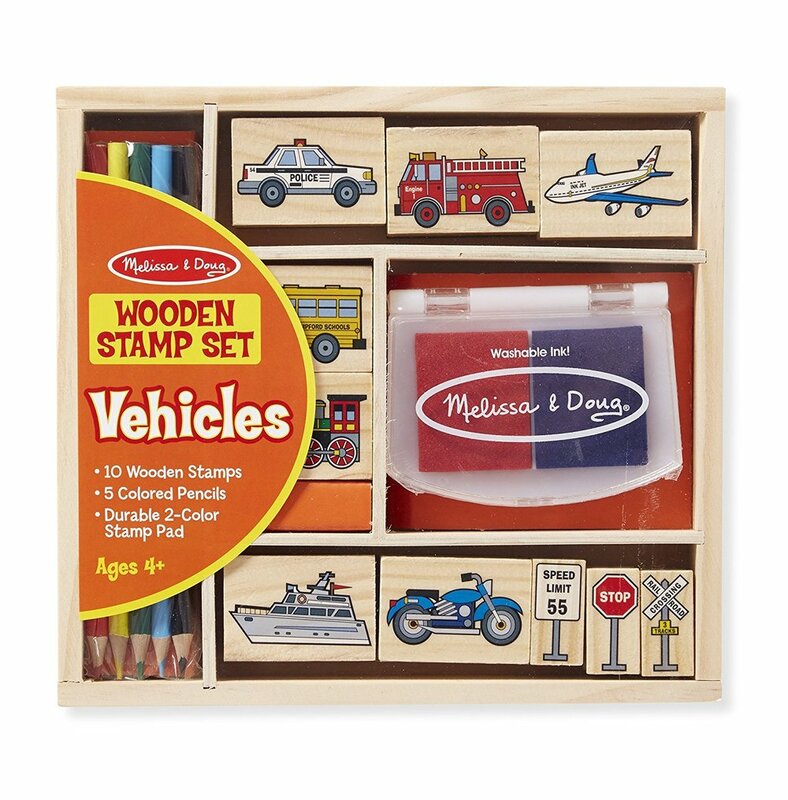 And then I opted for Melissa and Doug Vehicle stamps because he LOVES getting stamps at his classes at the YMCA and Children’s Museum. And both hands have to get stamped…you know, to make it even. Stickers could be fun as well, but they’ve been causing some frustration lately when he takes them on/off too much, and they lose their stickiness, or he sticks in on his skin and then it hurts to remove. 5. Plastic Eggs - I haven’t purchased anything for these yet, but they will be in the basket. I am headed to the dollar store to see what little things may fit. Some ideas I have so far are socks, stickers (maybe), more candy (hmm), temporary tattoos, or I might try to fit a few of the stamps into the eggs. This post had some other good ideas I might steal. Oh, and don’t forget to get a basket. We have a lovely little basket from Pottery Barn Kids, but look at this post for some chic and sweet basket options. That’s it. Trying to keep it simple yet enjoyable. I’m not an all natural, organic, free-range, gluten-free type mom (if you are, more power to you! ), but I do like to feed my family real food with wholesome ingredients. I check the ingredient lists on products I buy to see what the first ingredients are and prefer it when I recognize everything on the ingredient list. The idea naturally dyed eggs intrigued me and spiked my interest, but then I saw the amount of food you need to buy and the effort involved and nixed the idea. Then I came across the idea for Kool-aid dyed eggs. This idea strikes me as an excellent balance as I’m sure the ingredients in Kool-aid are slightly better than those in the Paas dye, right? The natural egg dying thing got me to thinking, though. How much dye passes through to the egg itself. Let me be straight; I don’t have a perfect answer. But with some quick research, I know this: eggs are porous to provide oxygen to the developing chick. However, chains form that prevent moisture and vapor exchange in cooked eggs, so it becomes resistant to absorbing outside ingredients. I don’t think we end up taking in too much of that coloring. And we're not eating tons of dyed eggs all the time, right? Wow, I went down a rabbit hole there. Let’s get back on track. Kool-aid eggs are this year’s craft. I’m going to try to get Caleb involved, but I may have to abort if things get crazy. Here’s the link to the Kool-aid egg dying I plan on doing. I plan to do just a few colors: strawberry, lemon-lime, berry blue, and orange. 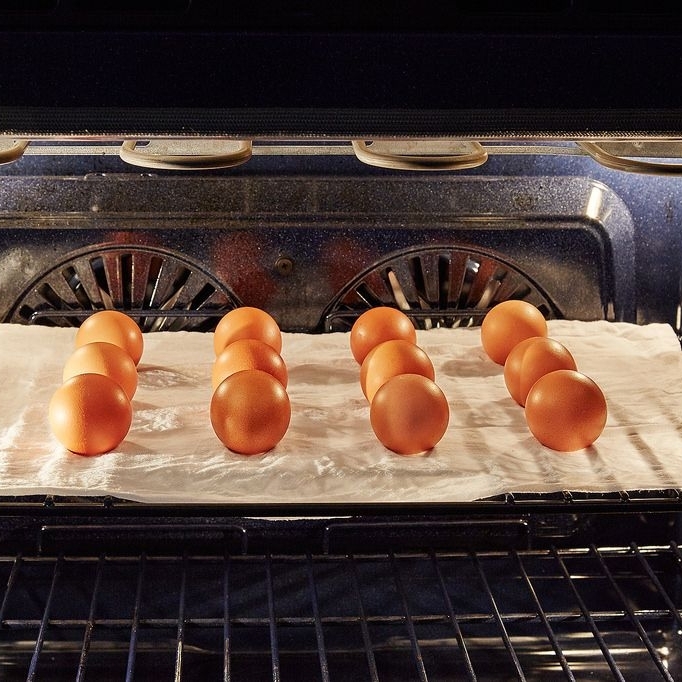 Oh, and I might try a new trick for hard boiling the eggs…in the oven (or Alton's method in the oven might be even better)! Update: I've been planning on Kool-aid eggs, but as of yesterday I'm discovering that grocery stores don't have the wall of Kool-aid packets anymore. I only found three flavors, and besides one flavor they were not the flavors I needed. I may end up with the usual Paas after all. Or, I just discovered all these ideas this morning. I'll report back as an update on the Raising Tacoma Facebook page. I don’t want to reinvent the wheel here because Sounds Fun Mom has a comprehensive list of Easter Egg Hunts all over the South Sound area. However, there are a few that especially caught my eye. The trouble I had with many of the Easter egg hunts was the timing - many of them had the event right dab n the middle of nap time. And we don’t mess with nap time. Luckily these two look like they will work great since they start in the morning. Details: Free, egg hunt, Easter Bunny, face painting, and special golden egg game. Details: Free, egg hunting, and bouncy castles. Note: We went to the NCC Easter Egg Hunt at Jane Clark last year. It’s walking distance from our house. If we do this again, I will want to find out when the different age hunts are happening exactly, so we are there in time. We arrived right when our age group hunt began, and it was like a madhouse. There wasn’t an egg left, but a sweet little girl gave Caleb one of her eggs. Also, I heard from a friend that attends NCC that the events are the same at both locations. The Star Center event could be fun to attend, but alas it is during nap time. Maybe you can go? Details: Free, egg hunts, Easter Bunny, food, crafts, games, and more. Trying to get an Easter Bunny photo last year was quite the ordeal. We tried going to the Bass Pro Shop on the weekend, and it was insane. If I remember correctly, the wait was about an hour long! So we nixed that idea. I ended up at the Tacoma Mall Easter Bunny. What’s great about this option, is you can select a specific date and time, so there is no waiting. The mall option was great, but what wasn’t great was the cost. I honestly don’t remember the final price, but I remember being frustrated. They didn’t give a digital copy, only hard copies. On the bright side, they took a few photos, so there was a higher probability of getting a good photo. Then it ended up that a bunny showed up at the Easter service, which was free and almost just as good at the mall photo. This year, I am just going to hope that an Easter Bunny shows up at the Easter Egg Hunt or church (although we attend a different church now, and I don’t think this church will have a bunny). Also, I was getting all tweaked out about finding an Easter Bunny this year until I realized I don’t even recall getting Easter Bunny photos as a kid. I do remember getting cute Easter outfits, though. So I’ve decided to be chill and not worry; if it happens, it happens. I’m sure Caleb won’t mind passing on the chance to sit with an overgrown bunny. If you are looking for a Easter Bunny, I suggest Sounds Fun Mom’s list again. You could try Bass Pro Shop mid-week in hopes of shorter lines, or go to the Tacoma Mall. I also think the Old Cannery Warehouse would be a good option. I tend to get all wound up trying to comes to holiday food. I enjoy baking and cooking and so I envision a beautiful feast on a gorgeously arranged table. It would be just like Chip & Joanna Gaines swept in and prepared everything for us. Alas, this will never really be the case, or at least not for a long time. For one, there is the time element. As in, when would I do all this cooking and finding of beautiful tabletop things? Then there is the financial element of buying all the ingredients and items. Lastly, there is the number of people element. Seriously two adults and one toddler won’t eat that much and having it so beautiful makes me laugh. I can see it now…Caleb grabbing a ceramic rabbit and running around the house with it and then putting it somewhere random like the laundry room. Given this, I am keeping it realistic yet festive. Breakfast might not be much since our church is pushing the service earlier to 8:30 AM rather than the usual 9 AM start time. That 30 minutes is critical. I was planning on a dutch baby pancake, carrot cake baked oatmeal, or carrot cake pancakes, but I am pretty sure it will end up being toast or something. For dinner, I am planning to make chicken cordon bleu, roasted potatoes, and asparagus. If there is time, I’ll make dessert or a treat of some kind, like carrot cake cookies or strawberry shortcake from The Magnolia Journal magazine. These all scream spring to me. I hope I get to make them. If I don’t, you totally should and then bring me a piece. The other food plans I have in mind are making something with the leftover hardboiled Easter eggs. I think an egg salad would be delicious, or I know Josh would appreciate some deviled eggs (with goat cheese since that's my favorite). Slicing them up for a salad would also be yummy. I wonder if Caleb would eat any of these things. Eh, probably not, but I’ll try! What are you doing for Easter? Are you all ready? Whatever you do, I hope it's hip hippity great!